The Laney College Digital Archives website is devoted to exploring the history of Laney College, from its beginnings in 1927 as Central Trade School to its place today as a comprehensive community college serving the residents of the Peralta District. 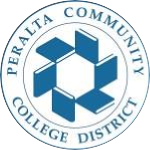 This website includes timelines of the history of Laney College and Peralta Community College District, historical articles about the college, biographical information about Joseph C. Laney, fascinating historical documents from the college and lots of pictures over the decades. 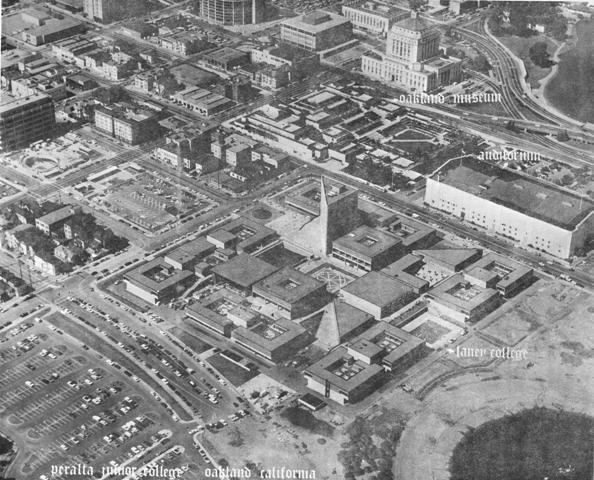 Photo (above): A 1950s aerial view of the lands south of Lake Merritt showing Auditorium Village, a wartime housing project, the Exposition Center and Exposition Field. 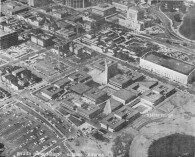 The site was later cleared for Frank Youell Field, the campus of Laney College, the Oakland Museum of California and Bay Area Rapid Transit facilities. Photograph by William A. High, Director of Audio-Visual Education, Oakland Unified School District. Courtesy Oakland Public Library, Oakland History Room.